A cartoon published in The New York World during the Great Steel Strike of 1919. After watching the labor movement—and the strike—wither over the past 30 years, trade unionists today need to answer several big questions if they wish to revitalize unions in this country. How should the labor movement deal with the current system of labor control? How should human labor be treated in relationship to capital? How can workers act as a class to advance their common interests? What are the best forms of organization to carry on the fight for workers’ rights? And finally, what is the role of the strike? The answers—or non-answers—to these fundamental questions will shape labor’s future in America. 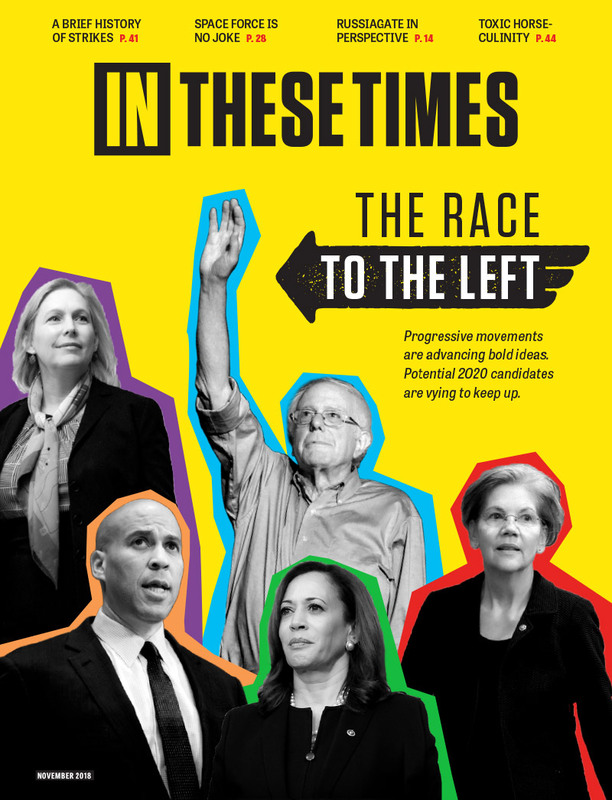 To point the labor movement in a new direction will require more than fostering discussion, however; it will require a large group of people willing to challenge the status quo, people who have the ideas, organizational skills and self-confidence to give voice to a workers’ movement capable of transforming America. This will have to start with the activists in the movement—shop floor militants, progressive union staffers and officers, worker centers’ activists, and friendly academics. However, the debate over the future of trade unionism must grow beyond this committed, but small group if the there is to be a true labor revival in this country. So how does one build such a trend? Again, we can learn from labor history. In the 1920s and early 1930s, the labor movement was stuck in a narrow form of craft unionism that was unable to win gains from employers. Craft unionists viewed only skilled workers as deserving of union representation, and they rejected attempts to organize all workers into one union. However, a countercurrent developed which argued that industrial unionism was the road forward for the labor movement. This trend toward industrial unionism was driven by the political left of the era (socialists, anarchists and communists), who had a program that, although varying in its approaches, shared one guiding principle: the strength of the overall trade union movement. This trend toward industrial unionism did not spring out of thin air, however, as these left-wing groups had spent the first several decades of the 20th century agitating—both inside and outside of the labor movement—for their aims. On the outside, the Industrial Workers of the World had strongly supported industrial unionism in both deed and action, while within the American Federation of Labor (AFL), William Z. Foster and John Kirkpatrick of the Chicago Federation of Labor had organized the great 1919 nationwide steel strike. No matter the battle or the union, the idea behind it was always the same for these industrial trade unionists—one employer, one union. Eventually, the years of agitation paid off as the idea of industrial unionism gained popularity, first at a grassroots level, and then broadly within the entire working class. Thus, when the economic crisis of the 1930s hit, workers were ready to embrace a new form of unionism. In "Heroes of Unwritten Story," Henry Kraus, the editor of an early autoworkers’ newsletter, recounts how workers in the 1930s rejected the narrow AFL craft unionism and fought to establish industrial organization. The task today is to build such a broad-based understanding within the labor movement of the need to change the present system. How can this be done? During the decades-long push to establish industrial unionism in the first half of the twentieth century, industrial union activists repeatedly raised their issues at union conventions. Following their historical lead, trade unionists today could adopt the position that the system of labor control is illegitimate, and support efforts to break free from it. This could take the form of convention resolutions as a way of raising the debate within the movement. Just as it was once official AFL policy to disobey injunctions, trade unionists today could debate whether or not to comply with the different facets of the system of labor control. No matter the issues, reviving the strike—and by extension, the labor movement—will require a single-minded focus by trade unionists. Right now, the left wing of the labor movement lacks a common agenda, as it advances a hodge-podge of ideas of what it will take to save unionism in this country. If one agrees with the analysis in this book, then the one unifying factor that can achieve the myriad goals of the labor movement is the revival of the effective, production-halting strike. This must become labor’s primary focus. The first is militancy. The union movement needs more of it, but even more important, American labor as a whole needs to stand behind those exemplary instances of class combat when and if they occur. The 1980s were a tragic decade for unions, not because workers did not fight, but where labor did take a stand—at International Paper in Jay, Maine; at Phelps Dodge in Ariz.; at Hormel in Austin, Minn.; at Continental and Greyhound—their struggles were both physically isolated and ideologically devalued. Instead of being engulfed in the solidarity of their fellow trade unionists, workers today who choose to fight back often do so on lonely picket lines, with little support from the official labor movement. Without a broad trend that promotes effective tactics, striking workers are not exposed to ideas that can help them win strikes, nor are they supported when they engage in militancy. In the past, even during labor’s darkest hours, workers were able to reach deep down to create new methods of struggle that transformed the political landscape, methods that relied on worker militancy and solidarity, supported by an effective strike. From REVIVING THE STRIKE: How Working People Can Regain Power and Transform America by Joe Burns. Copyright (c) 2011 by Joe Burns. Reprinted with permission of Ig Publishing, Inc.
Joe, you are quite right that the strength which the unions gained in the 1930 and 1940s came from the industrial unionists of the CIO. Without the work of shop floor militants imbued with that philosophy, the AFL could not have built the foundations of a middle class life for American workers. But once that foundation of unionized labor was built by the early 1950s, the bureaucratic leadership of the AFL-CIO relentlessly purged the industrial unionists. Even as late as the 1980s, I heard AFL-CIO paid staffers using classic red-baiting to smear dissidents who threatened their cushy jobs. McCarthyism is often seen as a transient episode affected people like Hollowood screenwriters and the like, but its real impact was on militant unionists and it went on for decades. Even when they were willing to call strikes, AFL-CIO bosses went for the traditional work stoppage where workers simply stopped working, and getting paid, until the strike was settled by the well-paid negotiators. They were rarely willing to risk the kind of limited one-day or rolling strikes popular with European labor because they would mean relying on grass-roots leadership and giving up their own control over the whole process. And naturally when you are on strike and without a paycheck for week after week, you are eager to accept whatever settlement union bosses work out – even if it involves crippling give-backs. You are also right that whatever passes for the left wing of today’s labor movement “lacks a common agenda, as it advances a hodge-podge of ideas of what it will take to save unionism in this country.” This is not surprising because today’s left lacks the comprehensive ideology of the socialists, communists and anarchists you cite. There is, quite simply, no dream of a new society to animate the left. This, too, is a product of decades of McCarthyite elimination of anyone who talked like they had read even a page of Marx or Debs. Not that the industrial unionists, acting alone, could have built the groundwork for a middle class. That was never their agenda and the fact is that radicals like the IWW won few or no lasting victories until they combined forces with the more limited objectives characteristic of the AFL. How a new labor structure combining AFL-style pragmatism with industrial union militancy will emerge is anyone’s guess. But a well-organized and consistent program of worker education, drawing on but not addicted to a socialist analysis, is a place to start. One historical model is the old Rand School in New York City, whose vast archives are still preserved at the NYU library.